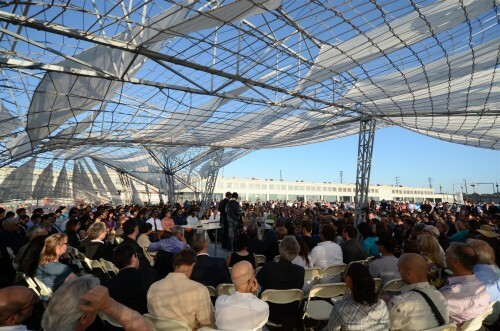 SCI-Arc held its graduation ceremony on Sunday in the parking lot in front of its building in LA’s Arts District. 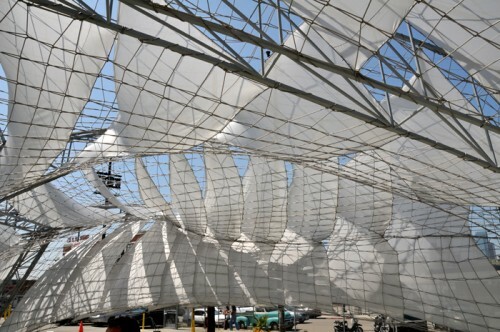 And they did it in style: in front of a billowing 60 x 110 foot canopy designed by LA firm Oyler Wu Collaborative, whose principles Dwayne Oyler and Jenny Wu are both SCI-Arc professors. SCI-Arc director Eric Owen Moss traditionally asks one of the school’s faculty to design the pavilion. 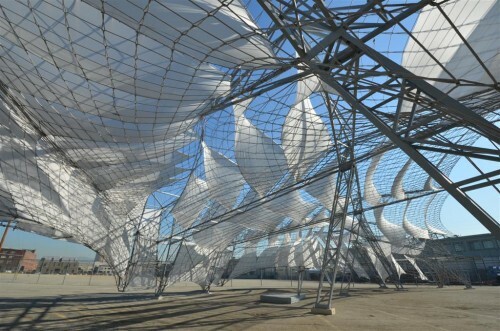 For the last four years architect Alexis Rochas has done the honors (check out his design from 2009), but this year he gave the job to Oyler and Wu, who have made a name designing ambitious installations around LA and elsewhere. 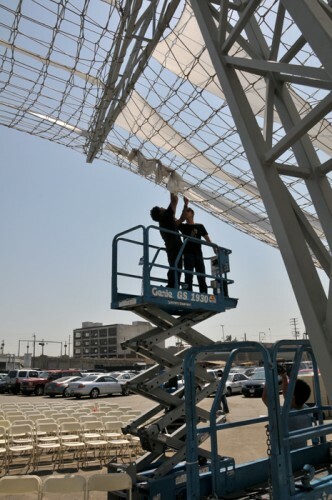 The team, with the help of both SCI-Arc students and their staff, built a billowing canopy consisting of a steel truss armature wrapped in a a changing grid of knitted rope, interwoven with a slightly translucent nylon mesh material. 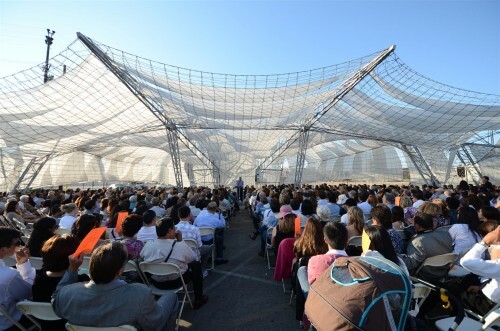 The structure was built to shelter 900 people. The firm began planning the structure in their graduate seminar this spring and started building it in June, welding, knitting and fastening virtually every day since they started. 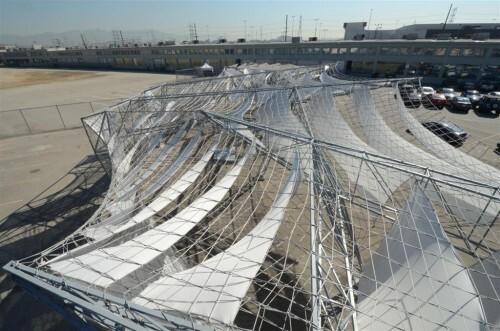 The rope’s gridded pattern was made possible through an old-fashioned knitting technique, in which the team developed giant pegs to recreate what old ladies have been doing for centuries. 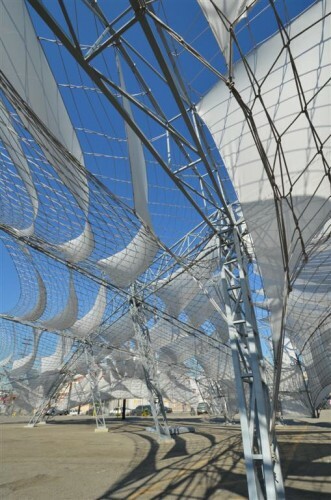 The ropes’ loose loops allowed them to contort the web’s shape so it stretches along its edges and takes on varying profiles throughout.The combination of steel rope and fabric somewhat resembles billowing sails on a ship. 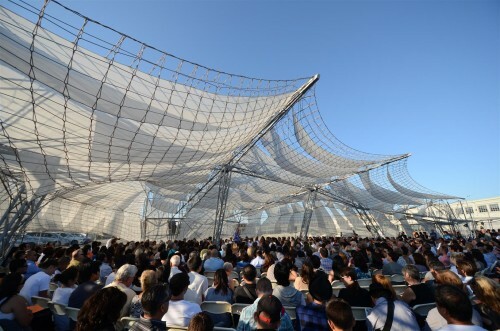 And the fabric, which creates intriguing shadows as well as providing shade, was angled just right to provide solar protection specifically at graduation time: 5 p.m.